New Chapter probiotic supplements is a line of whole-food-based, organically cultured bacterial products that have been naturally fermented. Their best-selling products are whole-food cultured multivitamins that are formulated with beneficial probiotic bacteria. Scientific research shows the significant role gut bacteria plays in health, wellness, vitality and longevity. Based on this information, more people are turning to probiotic supplementation in an effort to maintain good GI function, or to heal the dysfunction and disease within their system. The New Chapter line of probiotics dietary supplements, including Probiotic All-Flora and Probiotic GI Tract, contain specially formulated combinations of good bacteria to support gut function and improve health holistically. 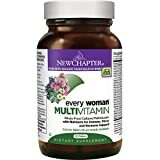 New Chapter consistently emphasizes their supplements are whole food live probiotics which use organic growth mediums of soya, making them an ideal choice for vegans and others whose systems may be particularly intolerant of lactose. Fermented soy has been used for thousands of years by traditional cultures in foods like miso and tempeh. Today these types of foods are considered “super foods”. New Chapter refers to their line of probiotic supplements as “Probiotics with a Purpose”. Combined together with the organic whole food growth medium, they are designed to deliver a full spectrum of live probiotic organisms. Lactobacillus acidophilus and Bifidobacterium infantis are included in both of their probiotic nutritional supplement offerings: Probiotic All-Flora and Probiotic GI Tract. Designed with a purpose, this nutritional supplement is a whole-food live probiotics GI tract support supplement. It delivers 10 different probiotic strains to cover a broad spectrum of gastrointestinal imbalances. New Chapter Probiotic GI Tract is said to offer the full benefits of whole-food culturing along with the live probiotic organisms. It also provides the beneficial compounds created through the fermentation process (the resulting ferment metabolites). These probiotics are cultured in organic bases of growth-stimulated prebiotic whole foods like okra, spinach, chlorella, blueberry, cumin and ginger. When culturing has completed, the fragile probiotic organisms are immediately freeze-dried together with their symbiotic food medium. Freeze-drying causes the cultures to become dormant, then once the capsule is consumed, the probiotics re-animate and are able to, theoretically, once again utilize the prebiotic-like food medium. Besides providing a wide spectrum of probiotic organisms in a vegan and lactose-free base, Probiotic GI Tract is also frequently used in detoxification efforts. One ingredient in particular, green chlorophyll is included to support individuals who are detoxifying their systems. New Chapter’s Probiotic All-Flora nutritional supplement contains over 8 billion live cultures in each dose. While this is lower than the CFUs in competing products which can contain up to 30 billion live cultures, it is still a significant dosage. These beneficial organisms are the result of a culturing process using soya as their growth medium. Uniquely, New Chapter also includes the “resulting ferment metabolites” in their formula. Although there isn’t a lengthy explanation regarding the specific beneficial effects which may be derived from the resulting metabolites, it is implied that they are able to be used again as a colonization stimulus by the probiotic bacteria once they re-animate within the human biome. Promote digestive health using live bacteria and prebiotic fiber. Balance gut microflora through the use of nine live probiotic strains which are in a whole food growth medium of organic apples and organic Jerusalem artichoke inulin. Beneficial to individuals who are lactose intolerant or allergic to dairy products because they use organic soy medium. Excellent potency due to ingredients being freeze-dried quickly after culturing has completed. Probiotic All-Flora: Take one capsule of this New Chapter supplement in the morning and one in the evening on an empty stomach or at least two hours after a meal when stomach acids are lowest. Probiotic GI Tract: Take one capsule in the morning and one capsule in the evening on an empty stomach for optimal results. This product should be kept refrigerated. Most individuals can take probiotic supplements without experiencing any side effects. Mild side effects which have been reported include bloating, gas and minor abdominal discomfort. These symptoms usually subside with continued use. People taking immunosuppressant medications and individuals who immune system is compromised should not take probiotic supplements. Research on the beneficial effects of probiotic organisms continues to garner a bigger share of funding and scientific attention. New Chapter probiotic supplements cater to an important niche base of individuals — vegans and people who are extremely lactose intolerant. Their customer base is not limited to these individuals, however, and both of their offerings may be good additions for people looking for a maintenance supplement, or for those experiencing mild GI tract dysbiosis. New Chapter probiotics have been uniquely cultured in organic vegetable and herbal mediums, which may provide additional health benefits to some individuals.